Anatomics was this week announced as a flagship project as part of the Federal Government’s $35 million BioMedTech Horizons fund program. The BioMedTech Horizon fund will support Anatomics to commercialise world-leading technology known as PoreStar, a porous high-density polyethylene material that is used to create implants that assist in the repair or augmentation of craniofacial bone, where patients have been born with a congenital condition, or suffered a tumour or trauma to the face and skull. PoreStar is the first synthetic product of its type that is able to augment bone and integrate into the body’s own tissue. 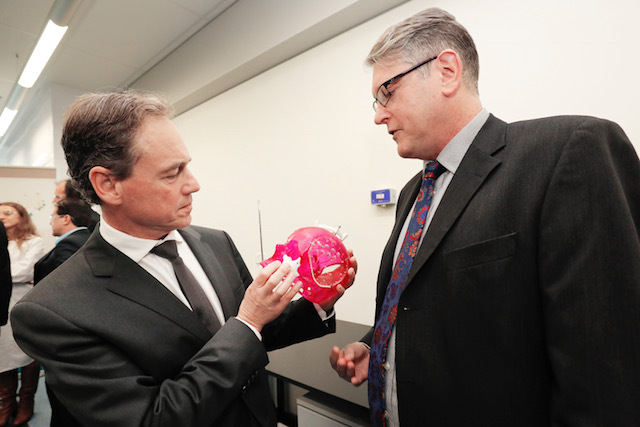 Executive Chairman of Anatomics Dr Paul D’Urso thanked the Federal Government including Health Minister Greg Hunt MP and the Managing Director of the Medical Technologies and Pharmaceuticals Growth Centre (MTP Connect) Sue McLennan for supporting Anatomics and Australian biotechnology innovation. 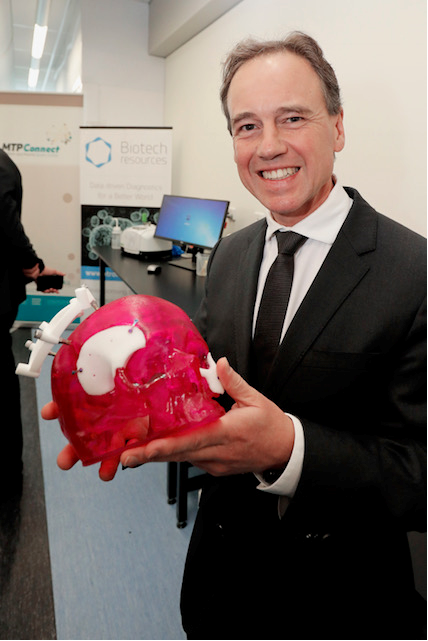 “I thank the Australian Government and Health Minister Greg Hunt for his commitment to Australian innovation firstly as Industry Minister and now as Health Minister, and also MTP Connect,” he said. “The funding will be used to continue to commercialise PoreStar and help Anatomics to stay at the forefront of showcasing to the world that Australia has equal or better capability among our scientists, innovators, medico’s and research institutions when compared to Europe and the United States. Anatomics has achieved a number of world-first milestones in medical technology and is widely recognised internationally for the world pioneering manufacture of 3D printed patient specific titanium prosthetics, creating a titanium heel for an Australian cancer patient that was printed by the CSIRO and implanted into the patient at St Vincent’s Hospital, Melbourne. This world-leading surgery resulted in the patient retaining his leg. America’s leading surgeons also called upon Anatomics to help a 20-year old American student to breathe again following cancer, using a 3D printed composite titanium and polyethylene sternum and ribcage prosthetic implant that replicated bone and cartilage. It is the first time the surgery has been performed in the United States. US student Penelope Heller had researched the Australian company online after finding that Anatomics had created the world’s first titanium ribcage for a Spanish patient. Penelope and her family spoke to her surgical team at New York’s upper east-side New York-Presbyterian/Weill Cornell Medical Center and the surgeons began investigating how Anatomics could help Penelope to breathe again by creating the implant. In a rare achievement for an Australian device manufacturer, Anatomics’ implant was approved by the US Food and Drug Administration’s (FDA), Expanded Access Program that can be used by American surgeons to implant non-listed devices where the surgeon believes the device provides a unique benefit to the patient. Anatomics has now received a 510k from the US Food and Drug Administration to market PoreStar in the United States for custom CMF applications (CMF refers to the design expertise of custom implants). Anatomics was also called upon by a Spanish surgical team to create the world’s first custom-designed 3D printed titanium sternum and rib cage implant for a patient who had lost his rib cage to cancer and was unable to sit-up, with the operation a success and the man able to walk independently as a result of Anatomics technology. Last year, a British surgical team contacted Anatomics to help them perform a UK-first surgery for a British man who had an infection eat away at his sternum. Anatomics designed a composite implant combining a custom designed 3D-printed titanium sternum implant with PoreStar technology for the surgeons. Anatomics provided the only solution available world-wide for the man’s sternum to be replaced. The custom implants are designed using high-resolution CT scans of the patient’s affected area that are sent to Anatomics engineers in Melbourne via the secure AnatomicsRx software platform. The requesting surgeon works with the engineers to approval the design and then Anatomics biomodelling engineers in St Kilda, Melbourne create a model of the required implant and work in conjunction with the Commonwealth Scientific & Industrial Research Organisation’s (CSIRO) 3D printing laboratory, Lab 22 at Clayton in Melbourne’s outer suburbs. All three patients have recovered extremely well following these pioneering surgeries. Dr D’Urso is currently working with Australian regulators to progress the use of custom-designed medical implants in Australian surgery. MTP Connect’s program aims to help Australia move more cutting edge-ideas and breakthrough discoveries towards proof-of-concept and commercialisation, and stimulate collaboration across disciplines between the research, industry and technology sectors to maximize entrepreneurship and idea potential.